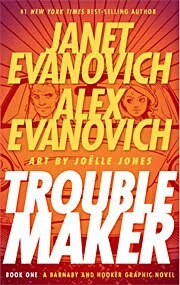 If you're interested in Janet Evanovich's upcoming graphic novel Troublemaker (a continuation of her Alex Barnaby series), you should check out the—mildly NSFW!—Etsy Shop of Joëlle Jones, the illustrator for the book. I'm pretty stoked: unlike many author/artist combos (ahem, Marvel), this woman's stuff looks like it will be a great fit for Evanovich's writing style. I'm not gonna lie; I will probably watch this.